Taco Macaroni Casserole - Home. Made. Interest. 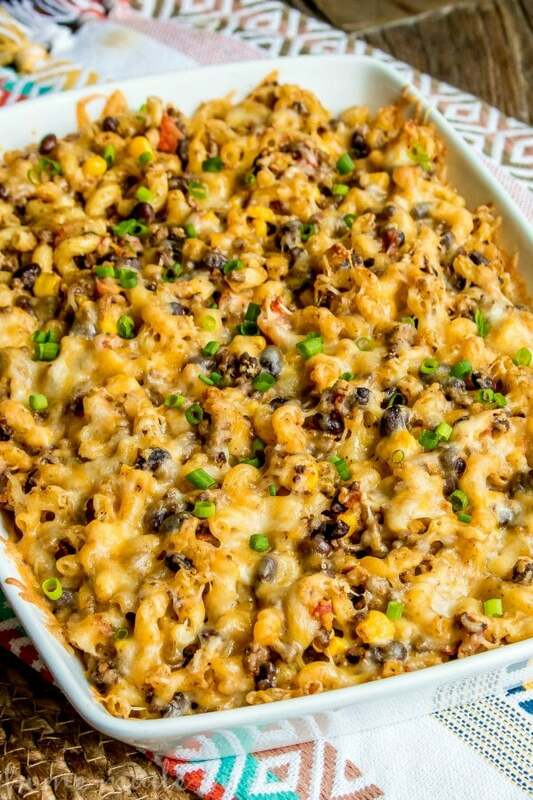 This Taco Macaroni Casserole is an easy taco bake recipe that gives your typical macaroni and cheese recipe a little Southwest flavor. I love food with a little spice and Tex-Mex recipes are some of my comfort food recipes of choice. I make a lot of tacos like these Low Carb Tacos (so cheesy!) 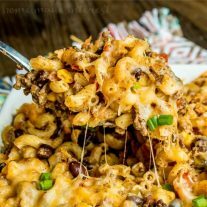 and these Easy Pork Tacos but I also like to play around with the flavors that make tacos so amazing and incorporate them into comfort food dishes my delicious Pressure Cooker Taco Soup or this amazing Taco Macaroni Casserole. Just because I like experimenting doesn’t mean I want to make things harder than they have to be. This taco casserole recipe is super easy to make. To get started you boil some macaroni noodles and brown about a pound of ground beef with some onions and taco seasoning. I like to make my own taco seasoning using chili powder, cumin, and salt but you can also buy a packet of taco seasoning at the grocery store. Once you meat and noodles are ready you add them along with all of the other ingredients, black beans, corn, salsa, sour cream, and cheese to a large bowl and mix everything together. Then you pour the mixture into a greased casserole dish and pop it in the oven. The casserole will bake for about 45 minutes, or until all of the cheese is melted and gooey. What you end up with is this pretty taco bake full of classic Tex-Mex flavors that your whole family is going to love. That’s it! I told you guys it is an easy recipe. Don’t be afraid to make this your own. If there is something else you or your family love in their tacos add it! Jalapenos, bell peppers, a mix of cheeses, pinto beans instead of black beans…make this recipe your own! There really isn’t any way to get it wrong. 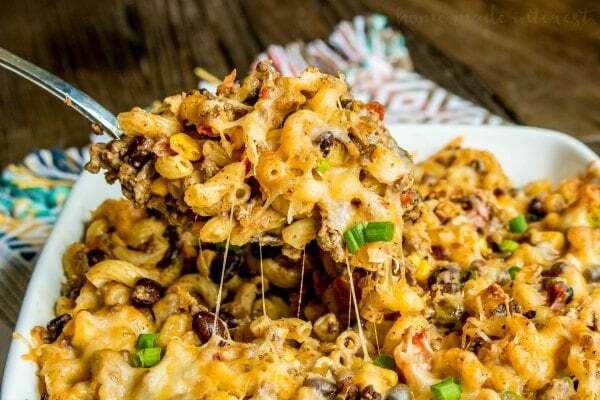 This taco casserole is made with macaroni noodles, tex-mex flavors, and lots of cheese for an easy weeknight dinner. In a skillet over medium high heat brown the ground beef and onions with a little bit of olive oil. Drain the grease from the cooked meat. Add the chili powder, cumin, and salt to the meat mixture along with 1/2 c water. Bring liquid to a boil then reduce to a simmer and continue to cook for 5- 6 minutes or until it has thickened. In a large bowl add ground beef mixture, noodles, black beans, corn, salsa, sour cream and 2 cups of cheese. Mix thoroughly. Add the mixture to a greased 13x 9 casserole dish and cover with foil. Bake for 30 minutes covered, then uncover and add the remaining cheese (more or less depending on how cheesy you want it). Then continue to bake for 15 minutes uncovered. Hi Dot, 3-4 cups. You will mix some in and sprinkle some overtop. Feel free to use less if you prefer. I have made this twice. Once without the ground beef, as a side dish for a potluck, and once with rotisserie chicken from Costco. Both times it was gobbled up. Thanks for sharing your recipe. This looks fantastic. The only changes I will make is to use taco seasoning and kidney beans. Thanks. I hope you like it as much as I did!! LOOKS LIKE SATURDAY NIGHT SUPPER TO ME! Yes you can freeze this. Just let it cool completely then wrap it up well before putting it in the freezer. I like to divide mine up into individual servings so I can just microwave it as needed. If you freeze the whole casserole just cover it with foil and heat it at 375 F for 30 mins or until heated through.